We offer a wide variety of prompting systems, sure to meet the needs of any video shoot, public speaking engagement or other event requiring teleprompting. Below are some of the most common types of prompters. If you do not see what you need, please contact us. Most likely, we will have that specialized piece of equipment in our warehouse. 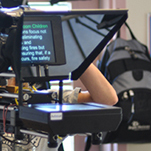 After you look over this information, if you're still unsure which prompter type is for you, or if you have any other questions, please don't hesitate to contact us so we can help. This system is meant to fit in front of a camera. The monitor is reflected in the glass panel, which is what the speaker reads. The lens of the camera fits into the hood of the prompter, into the hole in the cloth shroud. 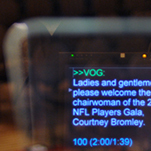 The speaker delivers their lines directly to camera while reading the reflected text in the glass panel. This is our largest and easiest to read system. It is well suited for static shots or light panning/tilting. 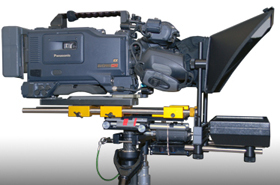 It can be mounted to a camera tripod as seen here or stand alone on our provided tripod. The prompter hood can adjust vertically relative to the monitor, and can accomodate a wide range of heights when mounted to our tripod. It can also be mounted on equipment like jib arms and dollys. Its smaller size and ultra-high brightness make it ideal for use in less controllable situations, such as outdoors or where multiple locations are required. It offers high visibility and super high brightness for outdoor shots, lighter weight for mounting on jibs and dollys, even hand-held in a pinch! 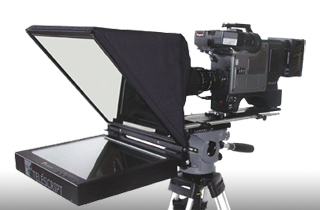 Just like the Standard Through The Lens prompter, this setup can be mounted on a camera tripod or stand alone on our provided tripod, as seen here. 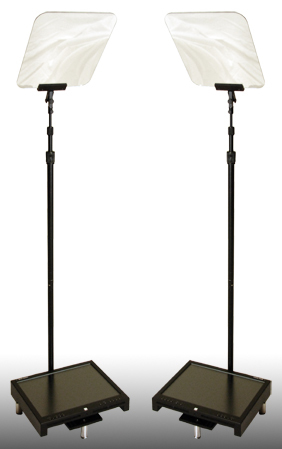 We offer both Top and Bottom-mounted High-Bright prompters. They are both excellent in all situations, however the Top-Mount version is best for very bright sunny days outdoors. 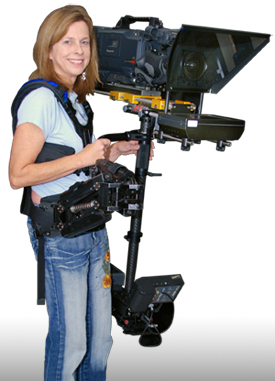 Among our smallest, this prompter is the best choice for hand-held applications, or as modeled here by our friend Sheila, Steadicam rigs. Just like its larger cousin, this prompter is extra bright for outdoor shooting, and can be powered by the camera's battery or via A/C power. 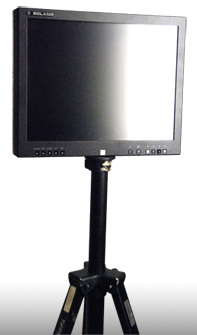 This prompter is ideal for situations where time and space are critical factors. This setup has much fewer parts and requires much less space to carry and much less time to set up. For companies doing in-house shots, this setup is ideal. It's quick, easy, and doesn't require lugging lots of cases through your office or work area. 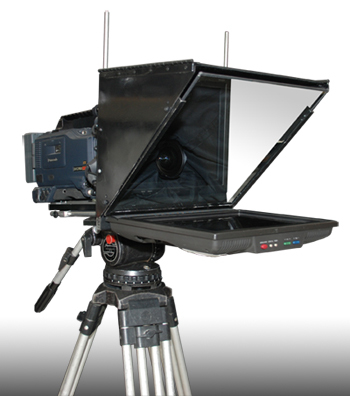 Just like its larger cousins, the Fold and Go prompter can be mounted to a camera tripod, as shown here, or to our own provided tripod. 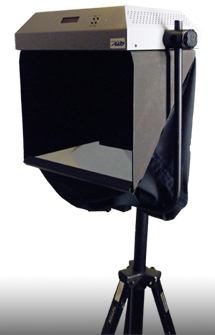 Please note that due to the construction of the Fold-n-Go prompter, it may become necessary to mount directly to the camera tripod for very tall shots. We can also simply mount a monitor on a tripod, as shown here. This type of setup works quite well for shooting dialogue, off-camera interviews, or any situation where the speaker does not need to look directly at the camera lens. Almost all of our monitors can be mounted this way. Regular, High-Bright, Large and small. All you have to do is tell us how many you need and we can have them ready for you. This system goes by many names. Some call it "Presidential" due to its high visibility at political rallies and public addresses. Some people just know it as "The one with the glass panels." When we talk about Presidential SpeechView setups, we usually talk in terms of how many "Podiums" you'd like. The height of the pole and angle of the glass pane are adjustable. Our normal setup consists of 19" floor monitors and poles that can accomodate most speakers. Our Presidential SpeechView prompters are incredibly versatile and will accommodate speakers of a wide variety of heights. However, when more than one person will use the system, height differences can become a factor. We will work with your speakers during rehearsal times to determine the best position of the panels so that everyone can see clearly and read easily, but in the event that there is a great difference between the heights of the speakers, our experienced technicians will provide workable, on-site solutions. The monitors, glass panes and poles are designed to be on the stage with the lectern. If this is not possible we can provide extension poles so that the monitors can be on the floor in front of the stage. Please note that the extension poles are not part of a standard Presidential Speech View package, and they are not compatible with the compact 15" monitors or high-bright 19" monitors. We also offer 24" monitors on tilting floor stands. This prompting setup is perfect for more dynamic staging designs, for instances where there will not be a lectern on stage, or when the speakers will be moving around on the stage. This setup is also ideal for musical performances. The standard setup includes 2 monitors, and up to 4 can be reserved. We are also able to provide just the technician and computers, to tie into existing equipment. Don't see it here? Have something else in mind? We can get it! Please contact us and we'll arrange for the exact equipment you need to be there when you need it. Capitol Prompting - We'll never leave you Speechless!